Above: William Farnum in the serial Adventures of Red Ryder (Republic, 1940). 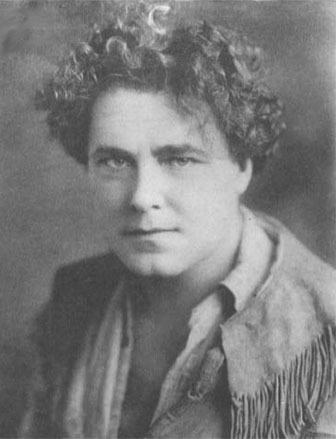 After enjoying a highly successful career as a major stage and silent-film star in the first quarter of the twentieth century, William Farnum faded into comparative obscurity during the talkie era; however, his name still retained enough marquee appeal to make him a valuable asset in the eyes of the producers of B-films and chapterplays. Farnum lent his distinguished presence to over half-a-dozen serials, playing various supporting parts in a vigorously dramatic style that was often stagy but was also decidedly magnetic; his theatrical gestures, emphatically expressive facial acting, and refined but resonant voice gave his serial characterizations an old-fashioned grandeur that invariably made them memorable. William Farnum was born in Boston; his actor father, G. D. Farnum, was the manager of a New England repertory company. The younger Farnum started learning the family trade at an early age, and made his first professional stage appearance when he was only fourteen years old–playing Brutus’ page Lucius in a production of Julius Caesar. This role was the first of many Shakespearian parts for Farnum; over the next several years he toured with his father’s company, gaining valuable acting experience and eventually graduating to leading roles; after his father’s retirement, he organized his own theatrical company. In 1900, he debuted on Broadway, playing the title role in an elaborate stage version of Ben-Hur, and later reprising the part in a touring version of the play which ran for five years. This success firmly established Farnum as a major stage star; he continued to work on Broadway and in other theatrical venues until 1914, when he played the leading role in the film The Spoilers–which proved a smash hit, and quickly led to movie stardom. In 1915, he inked a lucrative contract with the Fox Film Corporation; he would stay with the studio for the next eight years, starring in an impressive array of big-budget features–among them A Tale of Two Cities, Les Miserables, Riders of the Purple Sage, and If I Were King. He was injured and hospitalized in 1924 while filming The Man Who Fights Alone, his first non-Fox film of the 1920s; it took him years to fully recover. He returned to less strenuous stage work during his recuperation, spending most of the remaining years of the 1920s on Broadway. Farnum returned to the film industry in 1929–possibly in hopes of recouping his fortunes; the wealth he’d earned during his first stint in Hollywood was erased by the great stock crash of that year. However, his second sojourn in Hollywood was far less profitable than his first; although he played prominent co-starring roles in major early talkies such as A Connecticut Yankee, The Painted Desert, and Du Barry, Woman of Passion, his stage-derived predilection for “playing to the back rows” soon began to make his sound-film performances seem overstated. 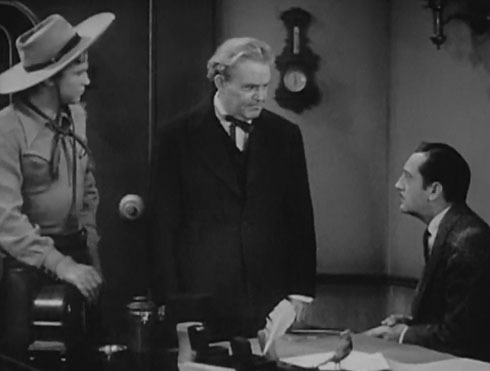 As the 1930s progressed, he was eclipsed by younger actors who found it easier to adjust to the presence of the sound mike, and soon found himself appearing chiefly in low-budget serials and features; the first of Farnum’s chapterplays was 1933’s Fighting With Kit Carson, produced by Mascot Pictures. Mascot’s boss Nat Levine was fond of signing former stars to lend prestige to his serial ventures–but, oddly enough, made very little use of the famed Farnum in Carson; the actor was cast in a small (and uncredited) role as an aggressively authoritative government official named Elliott, who pressed Kit Carson (John Mack Brown) into transporting a gold shipment before Carson could assemble enough men to do the job properly (this hastiness resulted in the loss of the gold to outlaws). 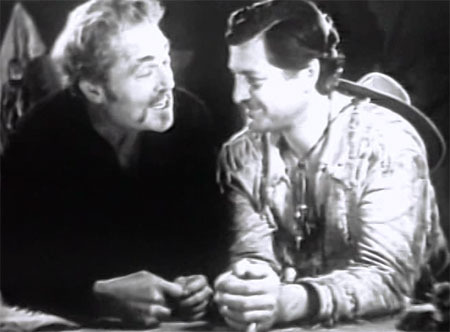 Above: William Farnum and DeWitt Jennings in Fighting With Kit Carson (Mascot, 1933). Farnum spent the next few years playing parts of varying size in B-films like Silver Streak, Between Men, or Powdersmoke Range; his past fame also won him some small but noticeable roles in A-features like The Count of Monte Cristo or Cecil B. DeMille’s Cleopatra and The Crusades. He didn’t return to the serial genre until 1936, when the Weiss brothers–the bosses of a small studio called Stage and Screen Productions–hired him to appear in a pair of chapterplays. Custer’s Last Stand, an ambitious quasi-historical epic produced on a shoestring budget, was the first of these two outings; Farnum was featured as a congenial Indian Agent named James Fitzpatrick–who did his best to prevent renegade Indians and white outlaws from disturbing the peace of the frontier, but failed to prevent the serial’s titular battle. 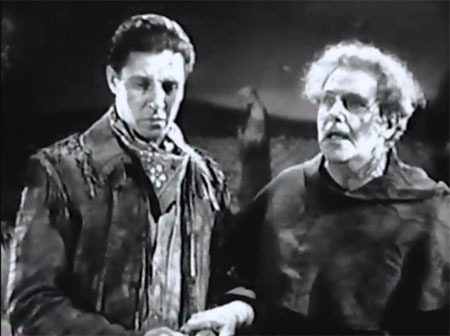 Last Stand was a creaky and sloppily-produced serial, but a rather interesting one; its enormous cast was filled with well-known players from the silent era (Farnum, Jack Mulhall, Helen Gibson, Reed Howes, George Chesebro), while its unusually dramatic (not to say melodramatic) script gave these old-timers material that they could really sink their teeth into. The result was a serial filled with highly theatrical but winningly sincere performances–Farnum’s chief among them. Affecting a pronounced Western accent, he played Fitzpatrick with a likable combination of dignity and folksy good-humor–cheerfully counseling hero Rex Lease, sharing hearty laughs with grizzled Indian scouts, gravely negotiating with the Indians, and sadly but kindly telling Custer’s wife (Ruth Mix) of her husband’s tragic demise in the moving last episode. 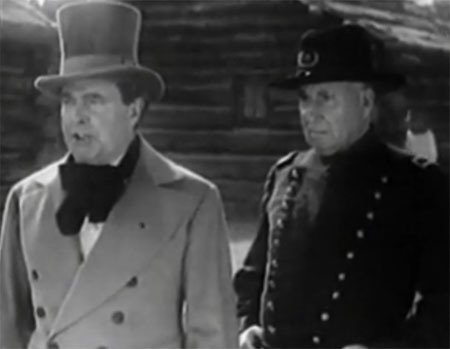 Above: William Farnum and Rex Lease in Custer’s Last Stand (Stage and Screen, 1936). Above: William Farnum comforts Ruth Mix in Custer’s Last Stand. Farnum’s second Stage and Screen chapterplay was The Clutching Hand, a hopelessly complicated mystery based on Arthur B. Reeve’s Craig Kennedy detective stories from the early 1900s. Here, Farnum played government investigator Gordon Gaunt, who provided brilliant freelance sleuth Kennedy (Jack Mulhall) with stalwart official backup throughout the serial. Farnum’s lively turn as the cigar-chewing, forceful, frequently puzzled, but always dignified Gaunt was characteristically grandiose–but, unlike some of the other cast members (who often stumbled over long-winded explanatory speeches in this basically retake-free production), he managed to rattle off the serial’s excessive dialogue with complete self-assurance; in classic stage-actor tradition, he regularly used dramatic gestures and expressions to smoothly cover his occasional slowness in delivering complicated lines. 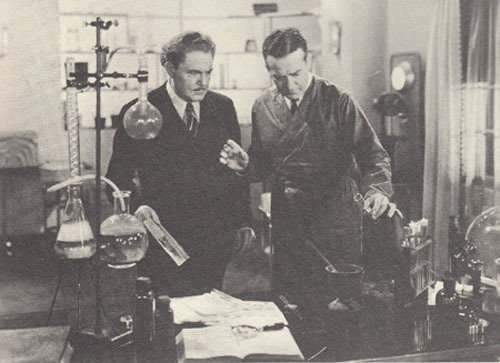 Above: William Farnum watches as Jack Mulhall engages in some lab analysis in The Clutching Hand (Stage and Screen, 1936). 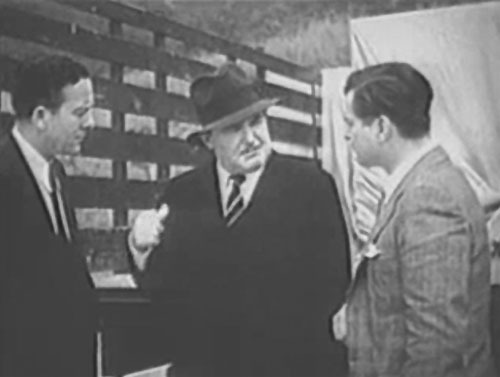 Above, left to right: Jack Mulhall, William Farnum, and Rex Lease in The Clutching Hand. Later in 1936, Farnum was again hired by Nat Levine for a serial appearance; the former Mascot producer was now turning out chapterplays under the auspices of the newly-created Republic Pictures. 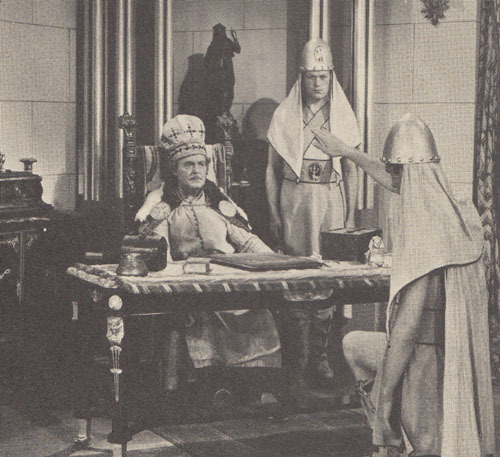 The serial in question was Undersea Kingdom, a science-fiction adventure set principally in the submerged but still inhabited realm of Atlantis; Farnum was cast as Sharad, the High Priest of Poseidon, who led a group of Atlanteans opposed to tyrannical usurper Unga Khan’s (Monte Blue) evil plan for conquering the “surface world.” When US Navy officer Crash Corrigan (Ray Corrigan) arrived in Atlantis via submarine, he was initially mistaken for one of Khan’s followers by Sharad’s forces, and narrowly escaped execution. Corrigan subsequently won Sharad’s trust and became the commander of his army–but, while he was eventually able to thwart Khan, he wasn’t able to prevent Sharad and his citadel from being destroyed by Khan’s forces in Chapter Ten. Farnum did little in Undersea Kingdom but grimly denounce Unga Khan and firmly avow his reverence for Poseidon; however, he handled both denunciations and vows with terrific aplomb–his grandiosely old-fashioned acting style being admirably well-suited to the portrayal of a ruler of an ancient civilization. Above: Lane Chandler (left) and William Farnum witness an off-camera attack by Unga Khan’s “Volplanes” in Undersea Kingdom (Republic, 1936). 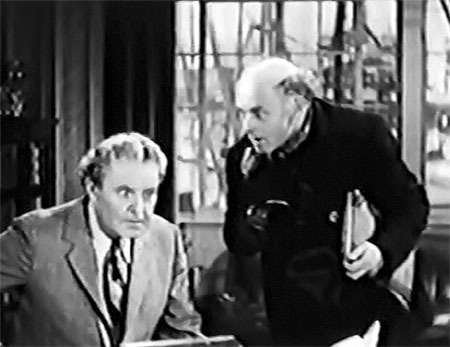 Above: William Farnum receives a military report in Undersea Kingdom. Farnum almost immediately followed his Undersea Kingdom turn with another serial appearance in The Vigilantes Are Coming (Republic, 1936). This chapterplay, set during the 1840s, featured him as Father Jose, a Franciscan padre who helped the Zorro-like avenger known as the Eagle (Bob Livingston) save California from the power-mad schemes of the dictatorial General Burr (Fred Kohler Sr.); the Eagle used Father Jose’s mission as a secret headquarters, posing as the priest’s organist when unmasked. Farnum’s here role gave him several excellent opportunities to be passionately sorrowful (when lamenting California’s peace), gently earnest (when offering advice to the hero) and fiercely irate (when thunderingly defying Burr and his minions). 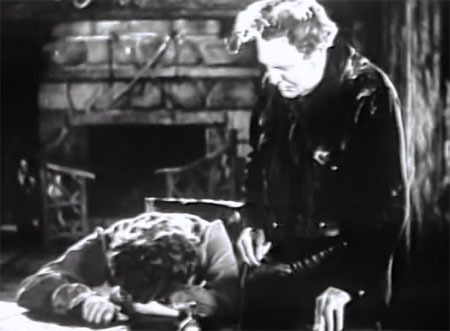 Above: Bob Livingston mourns for his murdered father and brother, as William Farnum exhorts him to battle the “forces of evil” in The Vigilantes Are Coming (Republic, 1936). 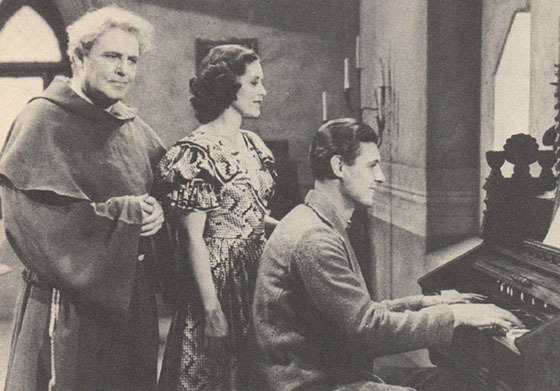 Above: William Farnum, Kay Hughes, and Bob Livingston in a publicity still for The Vigilantes Are Coming. In the second half of the 1930s, Farnum spent most of his acting time appearing in Republic B-westerns like Public Cowboy Number One, Santa Fe Stampede, and Mexicali Rose; he also began to dabble in radio work in 1937, appearing on anthology programs like CBS’s Silver Theatre. The 1938 serial The Secret of Treasure Island was one of his few non-Republic film vehicles during this period; the chapterplay was produced for Columbia Pictures by Louis Weiss, who had turned out Farnum’s two Stage and Screen serials two years earlier. Treasure Island, however, enjoyed a much higher budget than those two outings, and emerged as one of Columbia’s best serials. As a newspaper editor named Westmore, Farnum set the chapterplay’s action in motion by sending reporter hero Don Terry to the eponymous island–but remained in the background until the serial’s concluding chapters, when he discovered that heroine Gwen Gaze was his long-lost daughter; he then journeyed to the island himself, in time to participate in the serial’s climactic sequence. Farnum’s screen time in this serial was limited, but he made the most of it–reacting in suitably emotional fashion when he learned of his daughter’s identity, and tenderly but jovially bestowing a last-chapter blessing on the impending nuptials of hero and heroine. Above: George Rosener tells William Farnum that his long-lost daughter is still alive in The Secret of Treasure Island (Columbia, 1938). The Lone Ranger (Republic, 1938), featured him in a virtual reprise of his Father Jose role from The Vigilantes Are Coming; here, he was a Texas mission priest named Father McKim, who assisted the Lone Ranger in his fight against an outlaw dictator. Farnum had far less screen time in Ranger than in Vigilantes, but played this second priestly part in the same fashion as his first one–effectively and dramatically conveying both gentle piety and righteous indignation. 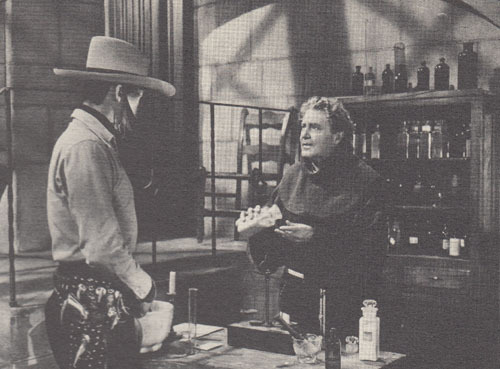 Above: William Farnum prepares medicine for an ailing settler as The Lone Ranger (Republic, 1938) watches. 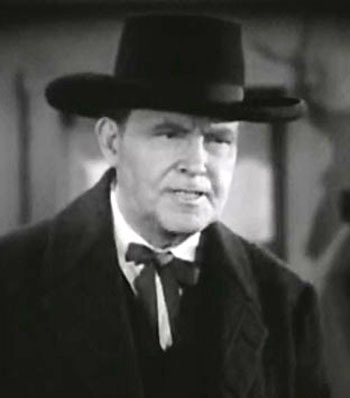 Farnum made his final chapterplay appearance in Republic’s 1940 Western outing Adventures of Red Ryder. His role here was small, but pivotal; as rancher Colonel Tom Ryder, he attempted to organize his fellow-cattlemen into a posse to suppress a ruthless outlaw band–but was ruthlessly gunned down by the outlaws before he could realize his plan. However, his son, “Red” Ryder (Don Barry) took up where his father left off, and wreaked grim retribution on the Colonel’s killers. Farnum played this part with his customary combination of dignity and benevolence, giving his character a vivid presence that added emotional weight to his sudden and violent demise. Above: Don Barry watches as William Farnum tells the seated Harry Worth that he’s going to take action against outlawry in Adventures of Red Ryder (Republic, 1940). Farnum kept working in film (and radio) throughout the 1940s, playing major roles in several more B-westerns (most of them for Universal), and taking minor credited parts in A-films–among them the 1942 version of The Spoilers and (much later in the decade) Cecil B. DeMille’s Samson and Delilah; in the late 1940s, he also starred in his own West Coast radio series, a homespun serialized drama called The Adventures of Uncle Jimmy. 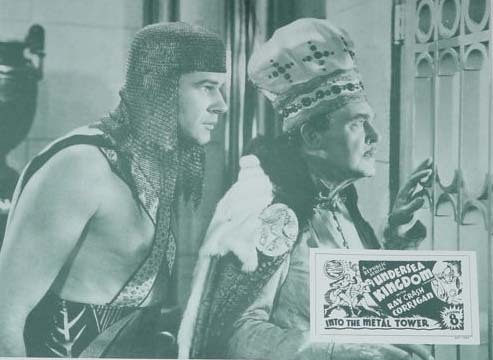 He made only a handful of film appearances in the 1950s–including cameos as himself in Republic’s Roy Rogers B-western Trail of Robin Hood and in the Universal mystery film The Hollywood Story; his final movie was the 1952 Abbott and Costello comedy Jack and the Beanstalk, in which he played a fairy-tale king. He passed away in Los Angeles in 1953; his funeral was attended by many distinguished actors and film-makers (among them DeMille, Pat O’Brien, Charles Coburn, and director Clarence Brown), who had not forgotten Farnum’s status as one of Hollywood’s first stars. Farnum’s work as a chapterplay character actor must have seemed like a severe comedown after his years of stage and movie stardom–but he never showed any on-screen disdain for his serial parts; on the contrary, he played characters like Jim Fitzpatrick or Father Jose with the same dramatic fervor he had brought to his long-ago starring turns as Ben-Hur, Jean Valjean, and other famed heroes. Archaic though his performances seemed at times, they were always impressive; whether he was appearing in prestigious features or lowly serials, William Farnum never merely “walked through” a role. Above: A 1917 publicity portrait of Farnum during his movie star years. Acknowledgements: The Old Corral’s page on William Farnum was invaluable in the preparation of this article; it not only provided plenty of useful information itself, but also furnished links to a database containing Farnum’s radio credits, and to an online copy of a 1917 film-magazine article written by the actor himself. W. K. Waters’ Internet Movie Database biography of Farnum, though inaccurate in some particulars, was helpful as well; I’m also greatly indebted to Ralph Pettie’s well-researched book The Farnum Brothers of Bucksport (Peninsula Press, 2000)–a history of the careers of William and his brother Dustin, also a major silent-film star.